Semantic search will improve search accuracy by understanding the searcher's intent and the contextual meaning of terms as they appear in the SERP's, To generate more relevant results on web or within the closed systems. The onset of digital marketing has made customer interaction not only real time but much easier too. The current trend of semantic search has forced the insurance sector worldwide to give an impetus to the role of search in connecting with the masses. 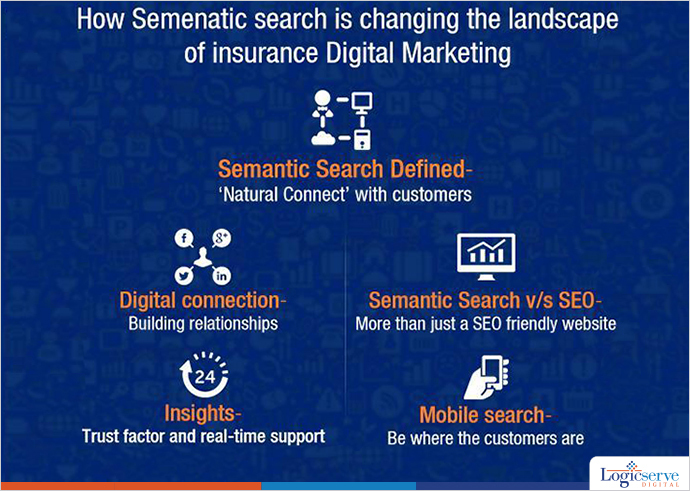 Undoubtedly, insurance digital marketing is likely to gain to great extent through semantic search. In simple words, semantic search will highlight those results whose content implies and satisfies the query searched for, rather than a mere mention online. When marketing insurance semantically, the emphasis should be on making a ‘natural connect’ with potential and existing customers. When you are availing digital marketing tools for your insurance services, the focus should be on meeting up to the customer’s expectations accurately. Crucial to the semantic search is the fact that your service meets up to the requirements of the customers. Look forward to a much personified websites which looks far more superior to the existing one. Yes, semantic search will enhance your website with a more impressive and meaningful identity that incorporates something more than just keywords, back links and other SEO technicalities – an identity with which your customers would prefer to be associated with. With search engines committed to providing accurate and meaningful results to the queries, a semantic approach promises to make your website even more meaningful. Digital Marketing has given leeway to connect with customers real time, albeit virtually. For some, it’s matter of convenience while for some it’s the preference factor. However, the core factor to ‘build relationships’ takes an entirely new perspective each time when you reach out to each other. With mobile becoming the preferred interface, it becomes inevitable to have a mobile presence. Crucial to the mobile interface, it the display of information and the ease in navigation simplifying a prospective customer’s visit thereby leading to a conversion or retaining an existing customer. The essence of your mobile interface should be highly convincing and assist the customer in making ‘the decision’ in your favour. Staying committed to serve and build the customer’s trust takes utmost priority as you interact with them across all levels. Real time support and responses go a great way in building relationships. No doubt always ‘being there’ for customers, is a difficult proposition but certainly not impossible. Finding ways out, offering real time solutions and support are definitely crucial to sustaining a healthy and budding customer relationship. Within the semantic search landscape, the digital marketing strategy works across two focal points. Undoubtedly, the prime focus is on ‘Customer Connect’ with the secondary focus on ‘Business Enhancement’, considering a multi faceted strategy initiated, offering an enormous amount of search data and related analytics.